A cosmic cat is seated or curled upon a small (2' diam.) meteorite half-buried in cloudstuff. Peaceful visitors will be favored with a look that suggests the cat’s opinions regarding the drollness of terrestrial existence. The cat will converse telepathically (it’s mind-voice has a reverse echo; its laugh has a touch of flange) and answer questions, though it’s responses will tend towardthe vauge if not the enigmatic. Oh. it’s you. I thought perhaps I had dreamed you, but you seem material enough. Unless that’s part of the dream, or my dreams are more powerful than I imagined? They once came here for amusement, you know. I suppose it’s all still very amusing, really, just in a different direction. By the time I arrived they had mostly abandoned this place, except the crazy ones. For a while at night, if I looked out over the cloud’s edge, I could see the blue glow of their ruins. That all faded away in a few centuries. I had an upset stomach, so I needed a place to rest and this rock seemed comfortable enough. I had eaten one of the those inky spiders from the dark side of the moon I caught crawling down a moonbeam, and it did not agree with me. It was foul. It tastes like curdled nightmares and acrid regret. How do you suppose all this stays up here on wisps of water vapor, anyway? Doesn’t seem safe. And it’s an affront dignity of other clouds. Don’t think they haven’t noticed. Have you ever tasted phlox? The color, I mean. It reminds one of the evanesce of comets and ephemeralness of thought. The Sun is just a dwarf, you know, made of countless little dwarfs. I met one, once. It made my eyes hurt to look at it. It was incandescent with tedious purpose, but it’s voice was warm on my skin and gave me the urge to nap. There’s a giant under that castle. He’s vaster than this world, perhaps--just folded up and stuffed into something tiny. I wonder how long that mellow cage of light and colored wax will hold him? Lamps flicker, after all. I wouldn’t go that way [island anterior]. You will likely either die by a fall from a great height or suffer a tiresome tea service with a chatty dragon. The meteorite it lounges upon is of iron as cold as the void. Its cosmic inertness is such that it is profoundly anti-magical.. In a ten foot radius all spells and magical effects dissipate. Magic items kept within a five radius of it for an extended period will be drained to mundanity at the rate of a +1 or spell level every six hours. There's a Halloween Sale going on on drivethrurpg and rpgnow. 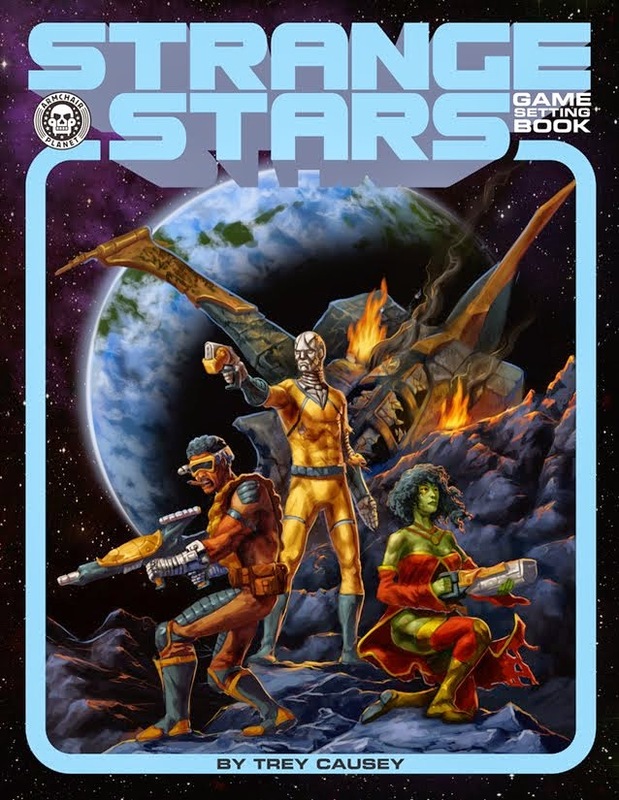 Both Weird Adventures and Strange Stars are in it, as are the rest of Hydra's quality products. Speaking of Strange Stars: the Fate rule book is literally all done but the contents page and last bit of prep for submission, so it should be dropping very soon. 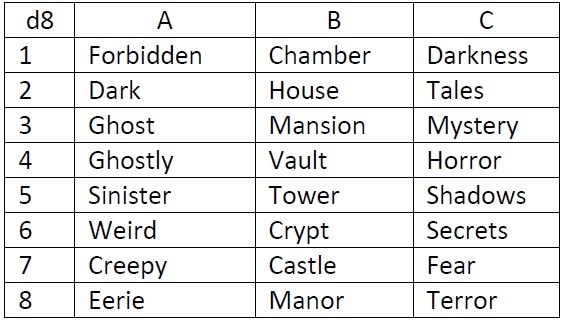 The OSR rulebook proceeds. Two complete chapters ("Factions" and "Adversaries & NPCs") are done, and a couple of others are close to completion. There once was a 6 year-old girl name Gertrude who fell into Fairyland. The kindly Queen Cloudia gave her a map and a guide named Larrigon Wentsworth III and set her on a quest to find her way home. Twenty-seven years later,Gertrude is physically no older, but is psychologically an adult--with a bad attitude. 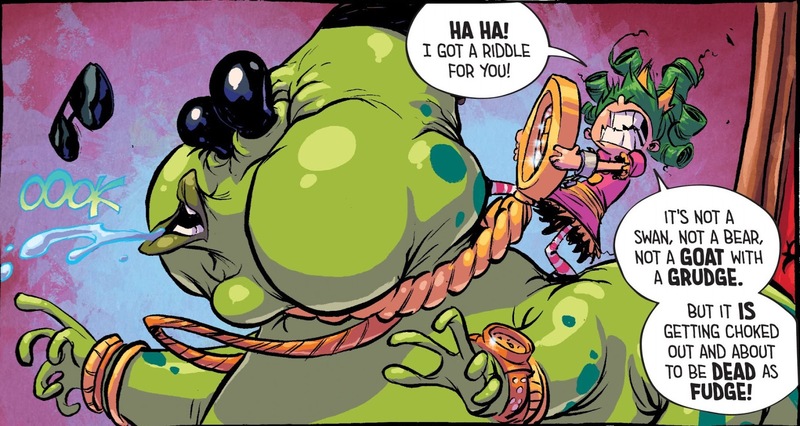 She also trips out after eating a bunch of mushroom guards in the city of Las Fungus and angers Queen Cloudia so much she sends a barbarian hit-man after her. Young (who also, ironically, illustrated Marvel's latest Oz book adaptations) has a style that's part modern animation and part classic comic strip. Everything here works great. The main question is whether he can maintain the tone and energy over an extended run. Halloween draws ever nearer, and with it, a bandaged wrapped form shambles out of the darkness. 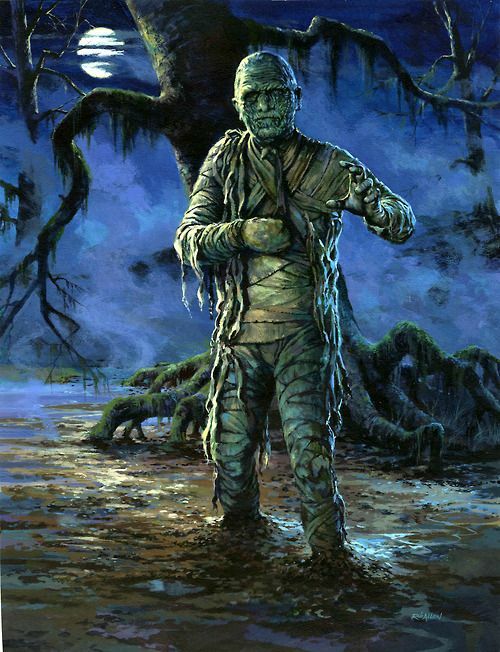 Too classic mummy-centric posts rocket from the crypt: 2010's "Famous Monsters: The Mummy" and 2013's unwrapping of variant mummy, revealing that "Mo' Mummies" may mean more than mo' problems. The Vitrified Forest, where lives a man with a very fancy hat. The Terrarium, giant-sized, as is everything in it. The Tower. where Zykloon, the Tornado Tyrant dwells. The Air Docks, where visitors once arrived to see the sights. 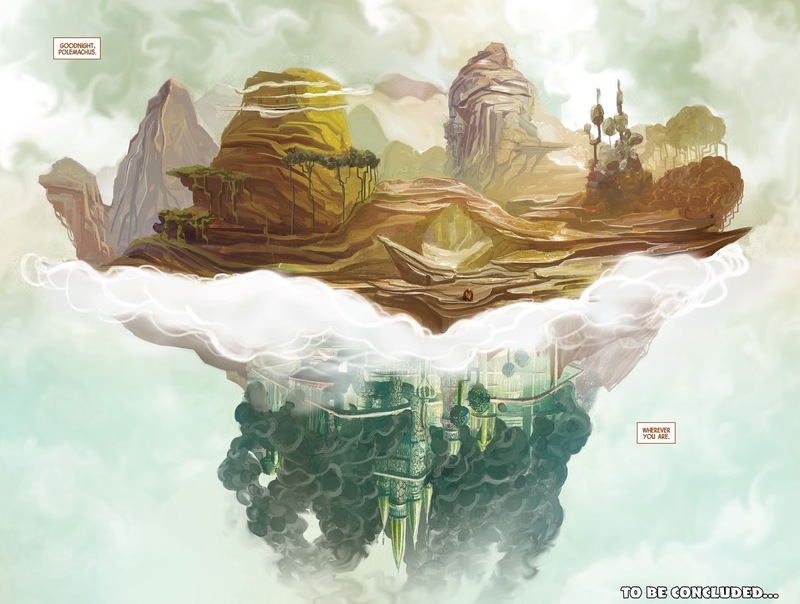 The Lair of the Cloud Dragon, perhaps not forlorn, but lonely. A Cosmic Cat, curled upon a fallen star. Since the days of EC, horror comic names often have a certain ring to them. Use this hand generator to create your own just in time for Halloween! While "Workers of the World, Unite Against the Faerie!" would be interesting enough, recasting the fairy presence with some Zone phenomena-like details out of Roadside Picnic and a bit of the seductiveness of the Festival from Singularity Sky: "Entertain us and we will give you want you want." 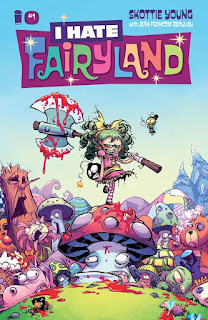 Faerie should be weird and horrifying but also weird and wondrous--in a horrific way, naturally. 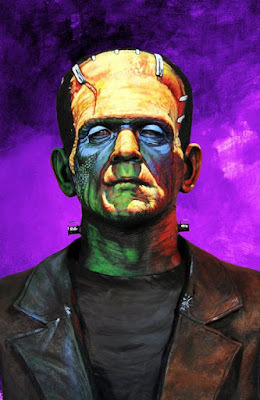 Miracles, wonders, and abominations. Of course, the authorities don't want anybody having interaction with the faerie, much less smuggling in their reality-warping, magical tech--and maybe they have a point. But if PCs did the smart thing they wouldn't be adventurers, would they? 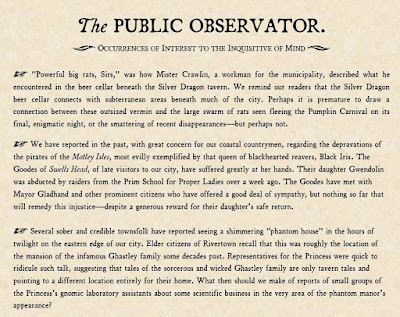 Another edition of The Public Observator for my home groups adventuring needs as our Land of Azurth campaign prepares to enter its second year. 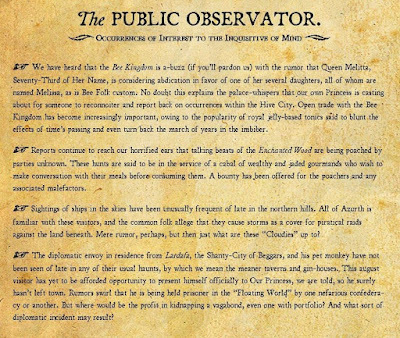 Eleven months ago, I presented a list of rumors for adventure fodder for the players from an in campaign broadsheet called The Public Observator. I thought it would be a good time to check back and see how many of those things the PCs have delved into. They first bit on the investigation of the Enchanted Wood. It turns about things were pretty much as rumored: There was a group of wealthy pleasure-seekers paying Ursa the Witch o' the Woods to turn them into manhounds. The PCs put an end to that. Next, their patron, Mayor Gladhand, asked them to look into the Lardafan ambassadors disappearance. 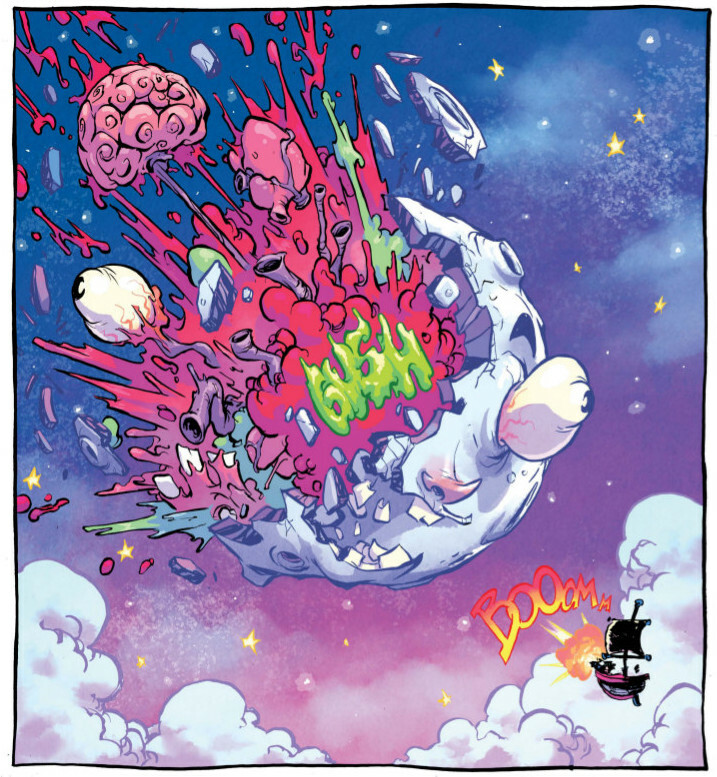 He was indeed in the Floating World and being held by the Burly Brothers and their gang.In the end, the ambassador was rescued and the Burly Brothers met their demise. After that, the party's curiosity was piqued by a mysterious device they found. This led them to ask the Clockwork Princess for help. 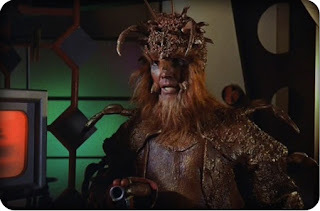 They undertook a mission to get light from a magic crystal in possession of a manticore mage named Mortzengersturm. He wound up being more than a bit homcidal, so the party had to kill him and take the stone--or at least the light from it. On the way back home, they were waylaid by a cloud giant wizard named Zykloon. He had the Cloud Folk under his thumb and was making them raid the surface world for him. The truth behind another rumor was discovered. So that pretty much gets us up to the present day. Of the original rumors, only the doings in the Kingdom of the Bee Folk have yet to be investigated. Not too bad. Post-Apocalyptic. The technology level of civilization in the past was higher than today. This provides the rationale for some “sufficiently advanced” Clark level technology, the “points of light” nature of civilization, and also for lost world exploration and space scavenging. Big But Bounded, and Subdivided. Strange Stars exists within one galaxy--and only a relatively small part of that one, but still there’s plenty of room for new clades, cultures, even minor empires to be introduced without much disruption. The use of hyperspace means that there are “clusters” that can serve as smaller sandboxes if the whole area is too daunting. 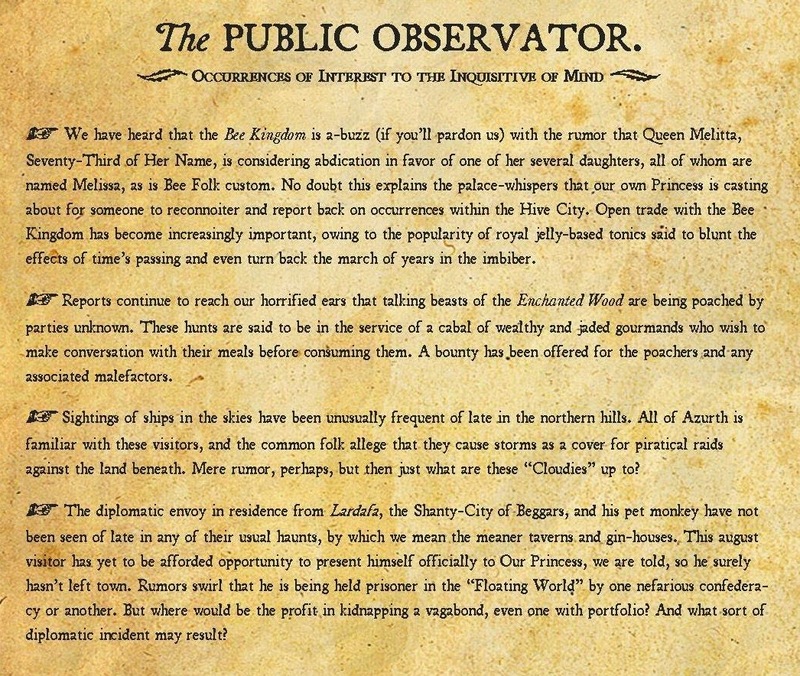 The game can be as focused as a single world or station. Harder than Average. 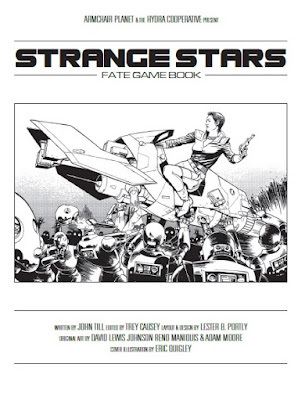 While Strange Stars is in no sense a “hard science fiction setting,” there are a number of details I tried to keep “semi-hard” and realistic. Earthlike worlds are most often the result of engineering and there are seldom multiple earth-like planets in a system. 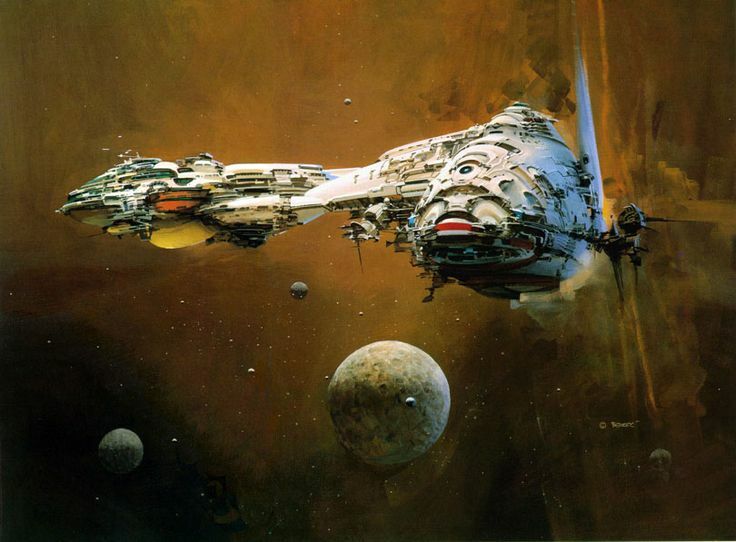 Most people will live in orbital habitats. FTL exists but works in such a way that it couldn’t violate causality. There are very few “single biome” planets, and those there are tend to have an explanation for why they exist. 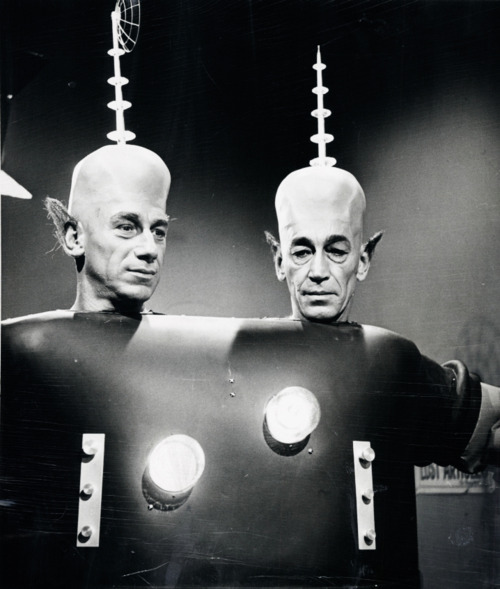 The aliens aren't very alien, but that’s because they’re most likely the descendants of humans or human creations. 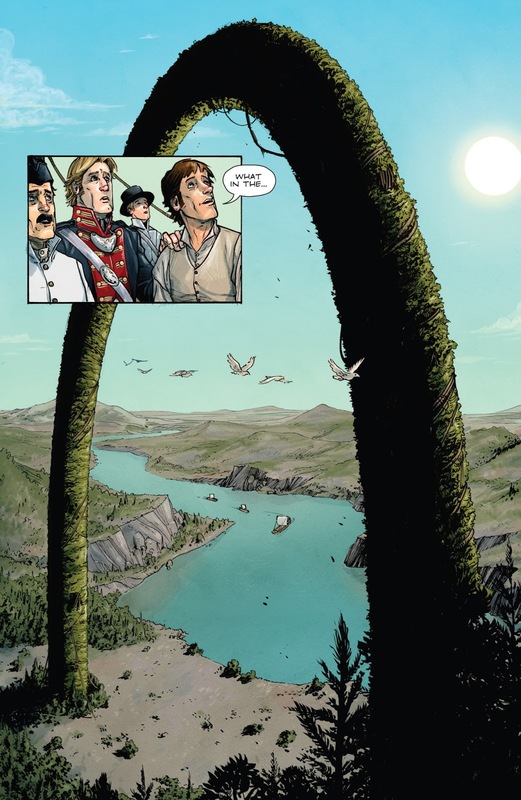 Synopsis: In May of 1804, the Lewis & Clark expedition is on their way to La Charette on the Missouri River. Lewis is the journal-keeper and artist, cataloging nature. Clark is the man of action and disciplinarian. We find out that they are keeping too logs: one for Congress (presumably the one history records) and another, truer log detailing their progress in their real mission from Jefferson: to clear the West of monsters. 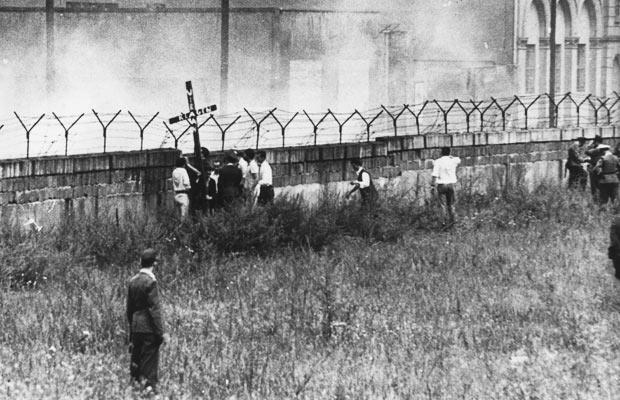 They investigate, thinking it must be some funerary structure or religious site. Jensen, a murder saved from the noose, is less interested in the arch and more interested in talking desertion with Wallace. Jensen has noticed that virtually everyone on this trip has no family. None of them will be missed. The sergeant overhears them discussing desertion and plans to report them. It doesn't get a chance as something emerges from the woods and charges over him. As it runs past the men, Lewis shoots it dead. Meanwhile, Jensen kills the injured sergeant so he can't reveal their plans. Last night, our fifth edition Land of Azurth campaign continued. A mysterious carnival on the outskirts of Riverton hadn't paid its taxes (and a few people have disappeared--but that's less important), so Mayor Gladhand asked the party to step in and take a look. Casing the place in the daytime when it was closed, revealed very little activity, but Shae the Ranger played Dr. Doolittle and found out the horses for the carnival wagons were actually townsfolk who had been polymorphed. The carnies run off the party before they can get more. This will be a theme of the session as the party tries to get to the horses to get more information, but are thwarted by carnie folk. The frogling thief Waylon theorizes horses may have switched places with humans! While the party plots, darkness arrives and the carnival opens. Dagmar discovers the ale and cider at the food tent is magical, but the party lets the townsfolk drink anyway to monitor its effects. As far as they can tell, it makes some people slightly sick and they are escorted out of the carnival. Meanwhile, some townsfolk disappear into exhibits, and halfling clowns seem to close in on the PCs, subtly, but menacingly. Pretty soon the carnival seems to close--but the real show begins. Carnies reveal themselves as wererats and attack. The turban of Marvello the Mentalist hides an intellect devour that attacks Dagmar the Cleric and Erkose the fighter. 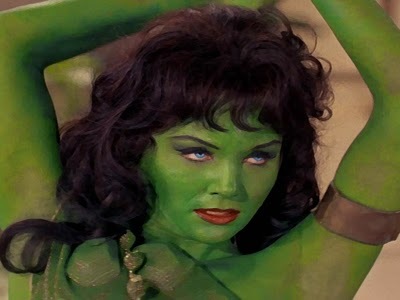 A cry for help from a damsel in distress in the peepshow tent turns out to be Verna the Viridescent Beauty who is really a green hag. 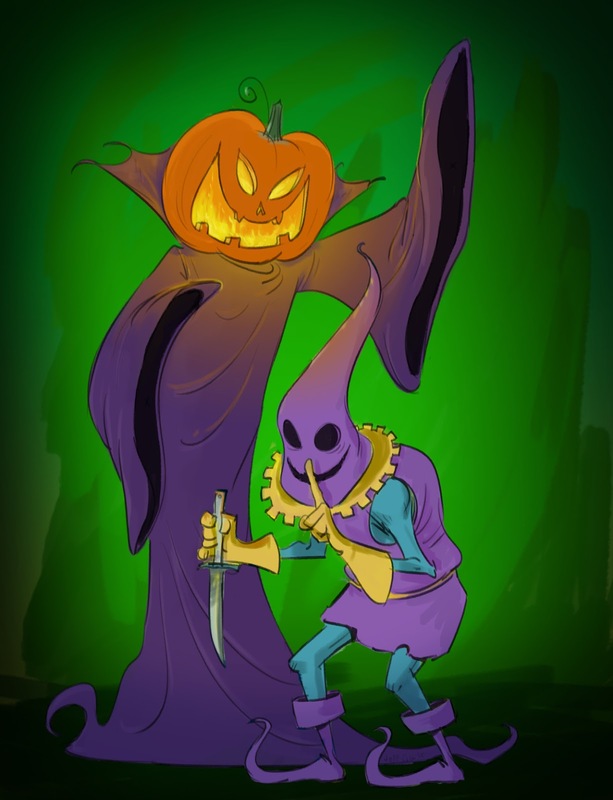 Mister Pumpkin, the carnival owner, makes his appearance along with an entourage of capering, knife-wielding halfling clowns. The party comes out pretty well, though. 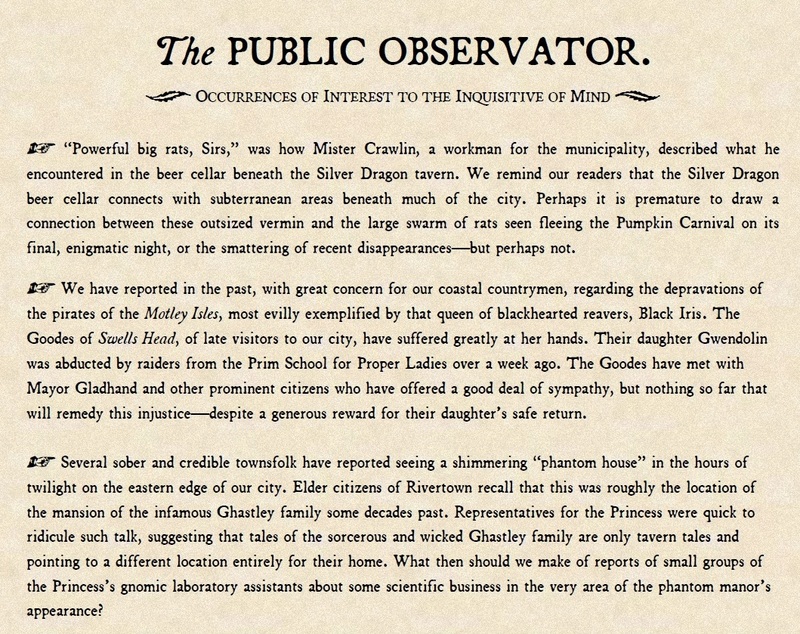 They discover that Mister Pumpkin is a rat-king and a swarm of rats beneath a robe. All the carnies are wererats, and all the animals in the menagerie are hapless polymorphed townspeople. 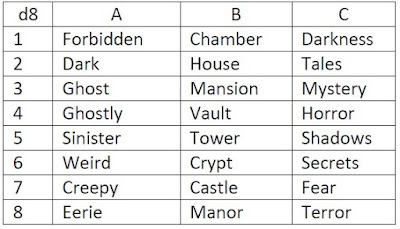 The rats flee, and the party confiscates their small amount of treasure without ever knowing the full nature of their plan, where the hag and the other monsters that might have been in the exhibits got off too, or what consuming the concessions will do to the townspeople. As a sort of lead up to the release of Strange Stars Fate (soon now! ), it's author, John Till has been doing some Strange Stars related posts on his blog. Even if Fate isn't your system of choice, there is some good and gameable stuff, here! A: Attendants--a moravec clade who provide topnotch service to the wealthiest clients. C: Clades and how you use them. D: Adding the Deaders from Last Parsec to Strange Stars. No two headed clades. Not even on Mars like in the Twilight Zone. The Lobster Man from Voyage to the Bottom of the Sea has no opposable thumbs. 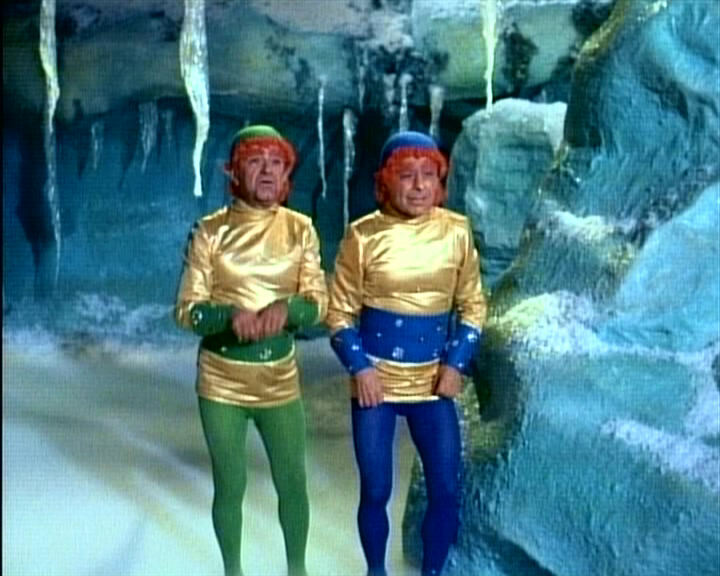 Like Talislanta, Strange Stars has no elves, so these guys from the Lost in Space episode "Space Vikings" are out. 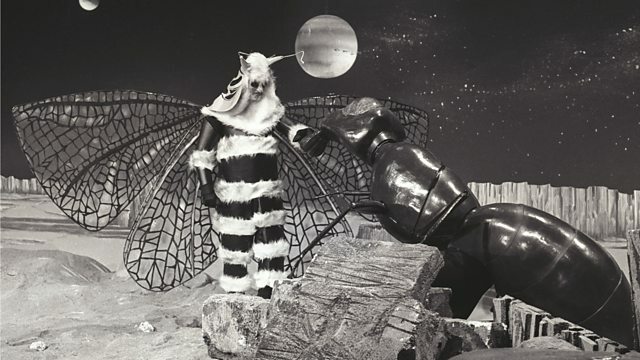 The zarbi and the menoptera from Doctor Who. What is there to say really? 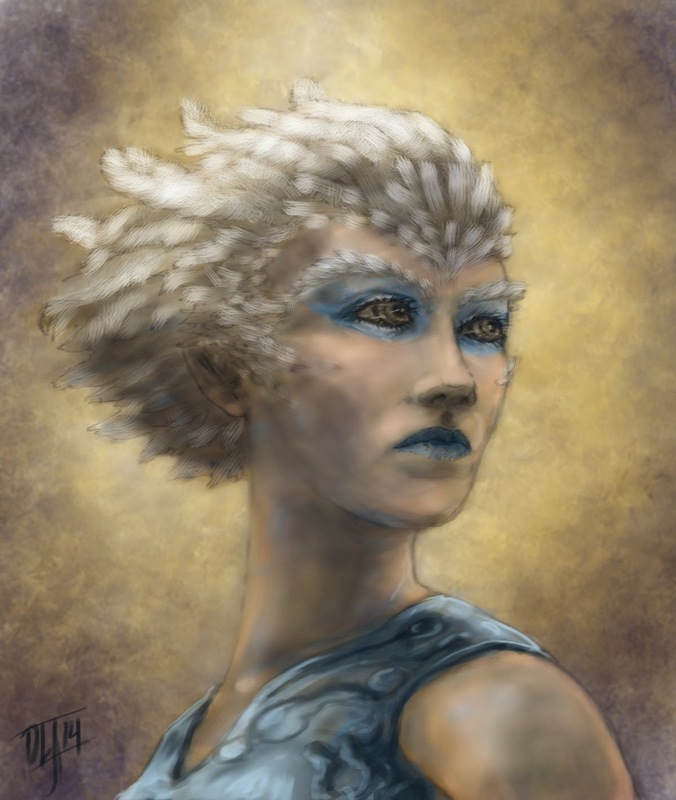 Physical Characteristics: Biologic humanoids with some avian characteristics. They have lighter frames than baseline humans, but are strong for their weight. Head and brow hair is replaced by light, downy feathers. Psychological Characteristics: Hyehoon are dynamic and inquisitive. They get along well with other clades. 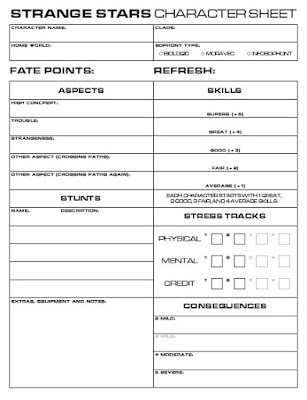 Backgrounds: Any; Adventurer, Astrogator’s Mate, Biotech Crew, Comm Crew, Politician, Researcher, and Technician are typical. Reviews of previous issues of Weirdworld can be found here. 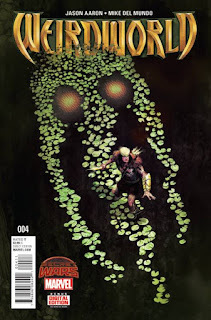 Synopsis: Arkon and Skull the Slayer have plunged into a swamp where the very touch of the vegetation burns. 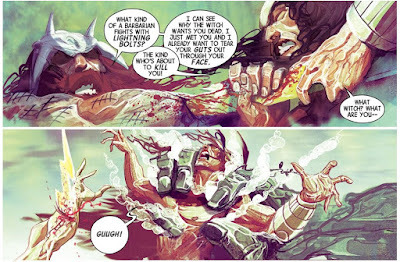 The Slayer has the upper hand, but Arkon luckily finds one of his lightning bolt-shaped weapons underwater, and stabs Skull with it. The combatants are both grabbed by plant creatures rising from the much--Man-Things. They again burn as they feel fear, Arkon sees the flames consuming his beloved Polemachus. The Queen of the Man-Things comments that there is so much fear in both of them. She is Jennifer Kale and she reveals that Skull is James Patrick Scully and they are both from the world beyond Weirdworld. She tells Arkon that it is Morgan Le Fay, the Baroness of Weirdworld that hunts him and Skull works for her. Kale wants to depose Le Fay and bring peace to the world and for that, she needs soldiers. She takes two winged frog things and puts them in their mouths. Arkon sees a vision of Polemachus upside down, but he realizes it's something more that his fear of his world being turned upside down. 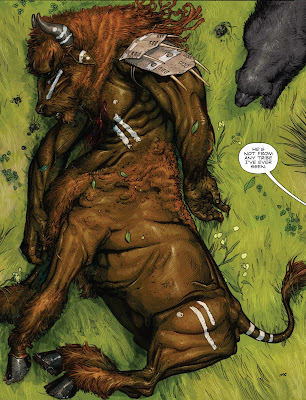 Man-Thing is famous (well, as non-top tier Marvel characters go). Jennifer Kale is a supporting cast character from the Man-Thing's comic; she's heir to ancient Atlantean magics. 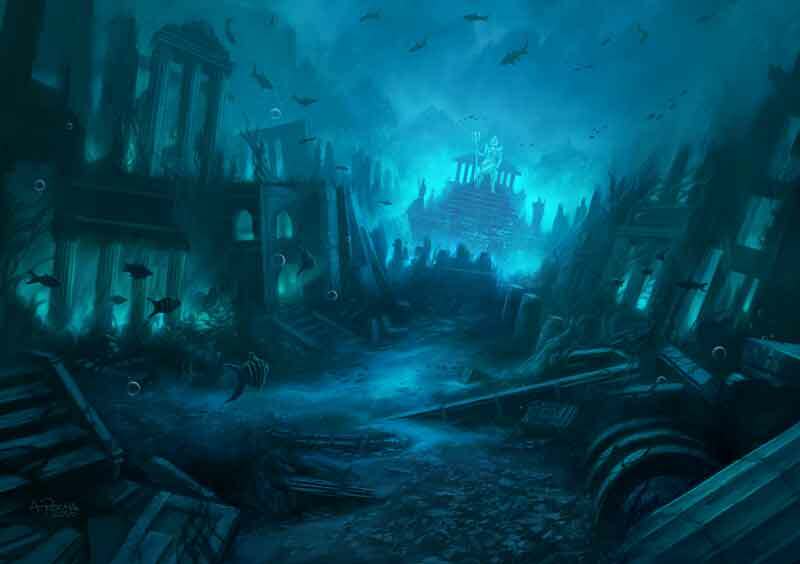 The Lost City: Inundated coastal cities might become lost or at least legendary. Ys is a good example. There's typically a mystery here or at least potent magic. It might be a whole area to explore, or just a bit of weirdness in a campaign. Looting the Depths: Jesse Bullington's The Folly of the World includes an attempted theft in town submerged by the Saint Elizabeth's Flood of 1421(the 20th worst flood in history). "Moon fishing" is apparently the term for treasure among the ruins of the towns flooded by China's Three Gorges Dam. 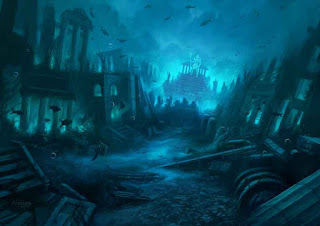 Looting underwater would present special challenges for adventurers and a different array of monsters than the usual. Something Strange Beneath the Surface: You already know about aquatic elves and aquatic trolls, but let's got deeper. In Swamp Thing #38, Alan Moore presents an aquatic mutation of vampires in the submerged town of Rosewood, Illinois. Any monster can have an aquatic variant but the key to making them non-mundane is having them by one-offs in unusual circumstances. Humza K, author of the Legacy of Bieth and newest Hydra Cooperative member, has started a series of interview posts at the Hydra blog about "Special Snowflake" D&D settings. His interview with me regarding the Land of Azurth was the first published. Looking for a good Kickstarter? Even if you're not, I've got one for you. 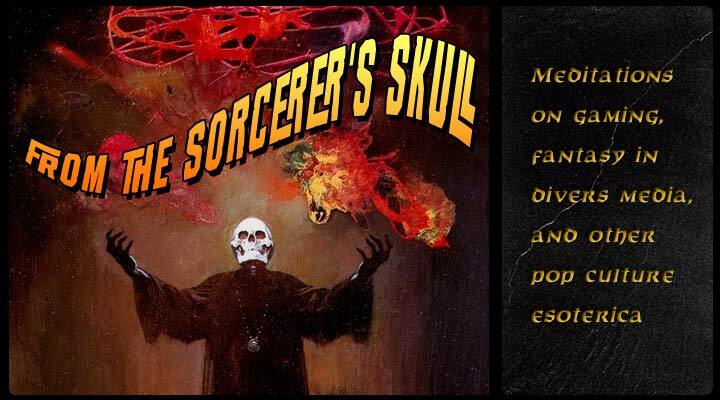 Friend of the Sorcerer's Skull, Mike "Wrathofzombie" Evans brings you a detailed setting for Dungeon Crawl Classics: The World of Hubris. Mike calls it a "high-octane, meat-grinder, weird fantasy setting," and I'd say that's just about right. Want to see for yourself? Check out his blog and where it has been developing. 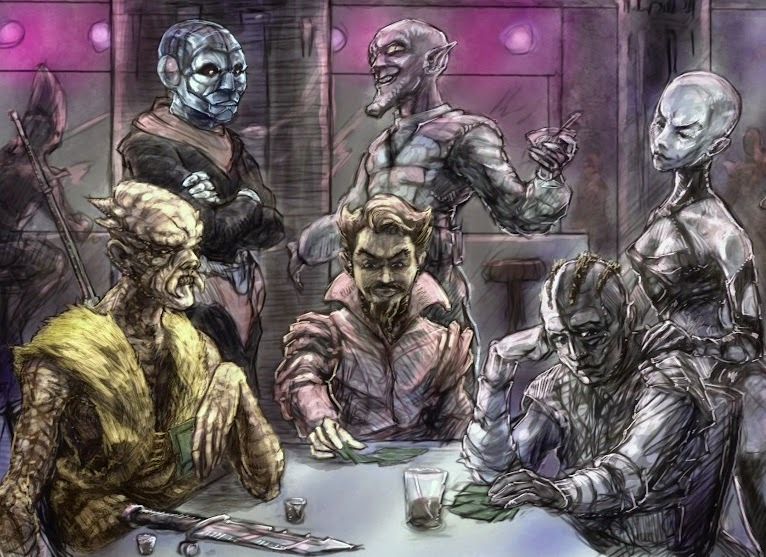 You also see some great art the likes of David Lewis Johnson and Jason Sholtis have done for the setting. If you like what you see (and why wouldn't you?) throw some love the Kickstarter's way.